The word tsunami is Japanese for "great harbor waves." Tsunamis are a powerful force of destruction. Tsunamis form when an earthquake hits the ocean. Earth’s crust moves and tectonic plates under an ocean rub together. The ocean floor then sends shock waves and can cause the first stages of a tsunami. Before a tsunami reaches land, there is no sign of danger. But, water then retreats from the beach and one may see a huge wave—a sure sign of danger. When water hits land, waves can be up to 100 feet high. The have a lot of force, and can destroy everything in their path. On December 26, 2004, the second largest tsunami in recorded history struck southeast Asia and kill hundreds of thousands of people all around the coasts of the Indian Ocean. 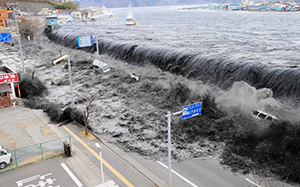 The tsunami was caused by an earthquake that lasted ten minutes. This is the longest earthquake ever recorded. In 1946, an earthquake in Alaska created a tsunami that killed 159 people when it hit Hawaii a few hours later. Additionally, an earthquake in Lisbon once caused a tsunami that killed over 60,000 people. A tsunami can start as small as 40 inches high and hardly be noticed, but it can still cause waves that race across oceans at speeds of up to 500 miles an hour. A tsunami can even travel across an entire ocean in one day. Tsunamis are a terrifying and deadly force, but scientists have now created a machine called a tsunometer that can predict when and where a tsunami may strike. This technology helps save many lives by sending warnings to places that may be affected.